So, you know what to expect in a general sense, but what about the details? When to stand or kneel, what are all those books for, where should you sit? In this section, we hope to give you a complete picture of a typical Sunday service so that when you visit us you feel comfortable and welcome. The Book of Common Prayer (the red one) will have directions in italics for standing, kneeling and sitting. However, we do all of those things as we are able. Some of us may have physical limitations that dictate what we can do during a service. Also, as Episcopalians, a lot of how you worship is left up to you. Some members of our congregation stand when others kneel, it depends on how you want to worship and what posture helps you to get the most out of worship. After the readings and the sermon, we say a confession together. The priest then offers us the Lord’s forgiveness, blessings, and peace. We then take a moment to “pass the peace” to each other by handshakes or hugs, whatever you are comfortable with. Then, at the 10:00 service, there is a loud thundering noise as the children from Sunday school come into the sanctuary. The kids gather up at the altar for a quick children’s sermon. Now we are better than half way through the service and we move on to the communion prayers. We celebrate the Eucharist every Sunday. That means that we receive communion, both bread and wine. All baptized Christians, regardless of denomination, are welcome to receive communion with us. It is the Lord’s Table and all are welcome. The ushers assist the congregation in going up to receive at the communion rails. It is customary to kneel to receive communion, but again it’s not required. If you need any special assistance the ushers are there to help you. 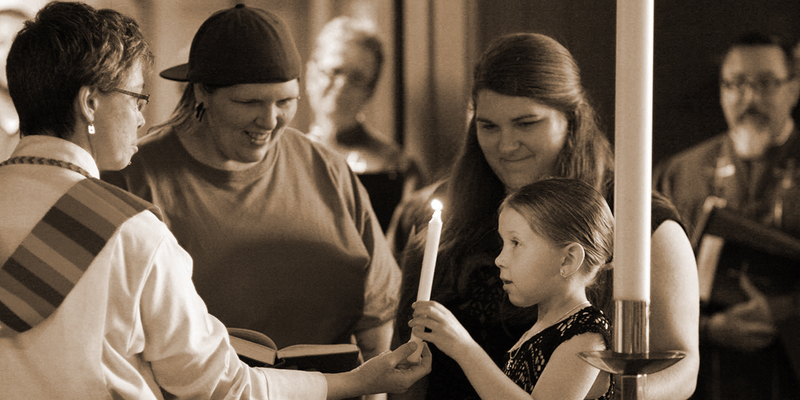 Small children are also welcome at the communion rail to receive communion or a special blessing. After communion there are a couple more prayers and a closing hymn. We have general church announcements, a final blessing, and then off to coffee hour. There are a couple of other things you might like to know. We have no dress code, come as you are. Some of us will be in jeans and some in our Sunday finest.